Self-harm is defined as deliberately hurting your body but without suicidal intent (Reachout, 2018). There are many reasons behind why people self-harm including bullying, stress, depression, troubling family life or trauma and abuse. There are many other causes as well. 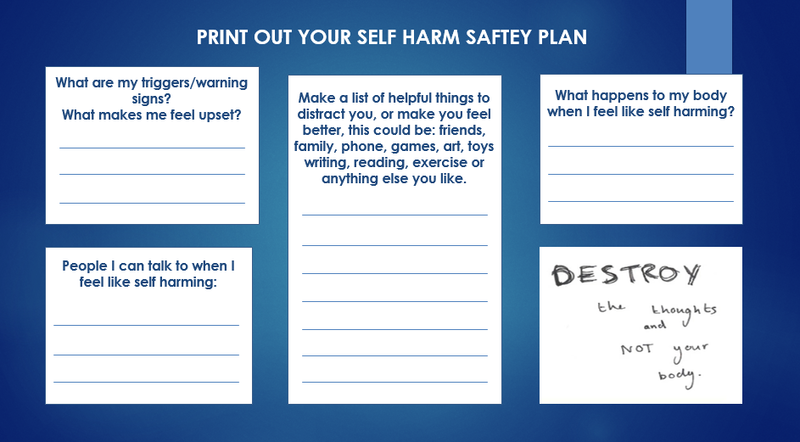 If self-harm is something you are considering or something you already do and you want some help take a look at our safety plan below! Alternatively, you can contact our office to speak with our mental health worker to get more 1:1 support. For more information about self-harm, the reasons, effect and to get support take a look at the links below.